A lovely snack, perfectly paired with a glass of sherry. You can make the pâté a day ahead, but the scones are best served hot and fresh from the oven. For the chicken liver pâté, heat a glug of olive oil in a frying pan over medium heat. Add the onion and herbs and fry until the onion is soft and translucent, about 10 – 15 minutes. Add the garlic and fry, about 30 seconds. Transfer the onion mixture to a blender and set aside until needed. Using the same pan, fry the rinsed chicken livers over medium heat, tossing, until almost cooked through, about 3 – 4 minutes. Be mindful not to overcook the livers, as that will give a grainy texture to the final pâté. Add the chicken livers to the blender and set aside. In the same pan, bring the sherry to a simmer over medium heat until about 30ml (2 tbsp) remains, about 2 – 3 minutes. Scrape the base of the pan with a wooden spoon to deglaze (you don’t want to lose any of what is left in the pan, as this will add a depth of flavour to your pâté). Add the reduced sherry and pan remnants to the blender, then add 50g melted butter and blitz until very smooth. Season to taste. Transfer the pâté to a serving bowl or a jar and smooth the top. Pour the extra 45ml (3 tbsp) melted butter over the pâté to create an airtight layer and place in the fridge to chill, at least 2 hours. For the scones, preheat the oven to 200°C. Place a standard baking sheet in the oven to warm up while the oven is preheating. Place the self-raising flour, salt, baking powder, black pepper and chopped rosemary in a medium mixing bowl and whisk to combine. Add the 80g chilled and cubed butter and, using your fingertips, rub the butter into the dry ingredients, leaving a few larger pieces of butter in the mixture. Gradually add the milk, stirring gently with a spoon (be careful not to overwork the batter), using only the amount of milk you need to create a soft, sticky dough. It shouldn’t be smooth – a bit of lumpiness and texture is good and means that the dough hasn’t been overworked. Cut a 30cm piece of baking paper and set aside. On a floured surface, shape the dough into a rough rectangle, about 2cm in thickness. Cut 6cm x 3cm rectangles out of the dough and transfer to the baking paper, leaving some space between each scone. Brush the tops with the beaten egg. Remove the baking sheet from the oven and transfer the baking paper with the scones to it. Return to the oven and bake, about 7 – 10 minutes. 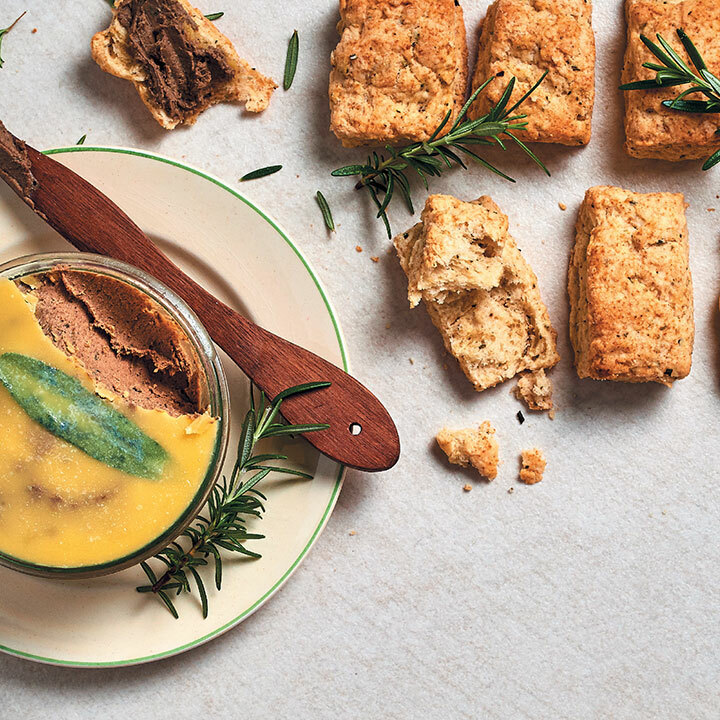 Serve warm, with the chicken liver pâté for spreading.